Overnight between February 9 and February 10 offender/s have approached and stolen a Hilux that was parked on the beach next to a campsite at Double Island Point, Rainbow Beach. The car is described as a red Toyota Hilux Surf 1992 import model with chrome and black 20inch rims, Queensland registration number 933XZW. 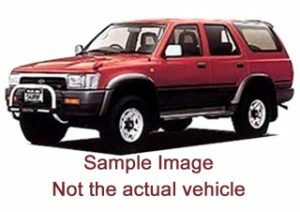 Police are asking anyone who may have sighted this vehicle to please report. You can report information about crime anonymously to Crime Stoppers, a registered charity and community volunteer organisation, by calling 1800 333 000 or via crimestoppersqld.com.au 24hrs per day. Do you recognise this diamond ring? Welcome Bush to the Beach kids! Visit Rainbow Beach magazine for New Zealand Hey Heatley and Michelle, Great job!!!! Wish we’d taken out more space!! Congratulations on a job extremely well done! Going forward with this type of promotion, I can tell you – sign us up for 1/2 page! Hi Michelle, I just wanted to say a big thank you for the great picture on the front of this month’s paper. The timing was perfect for us having the review on, but also just to show what a fantastic time people have at the playgroup. We appreciate the support we get from yourself and Heatley each month. Your paper’s one of the best! With the clarity of photos and everything, it is well above the standard. You should be congratulated! Thank you so much for listing World Day of Prayer under 3 March 2017, these two months, and for your feature article in March. MUCH appreciated, splendid! The ad is absolutely brilliant!!! Thank you Michelle, Sally, Heatley … for your enthusiam, bright, cheerful, caring and interest in what is happening in our lives and in our very special community. Am very excited, and really appreciate your enthusiasm and support. Dear Michelle and Heatley Our copy of RBCCC News was delivered yester afternoon in Buchanan Avenue, TCB. We usually receive it on last day / first day of the month, well done! Thank you VERY much for our photo and article on page 7, for our advertisement, for referring to World Day of Prayer on March 2 in your editorial, as well as including our event time and location in “What’s On”. Much appreciated! Cheers, many many thanks. Contributions are welcomed from individuals and community groups by the 20th of each month. Issues are delivered on the 1st of the month. A total of 4000 copies are delivered to Cooloola Cove, Rainbow Beach & Tin Can Bay at selected drop off points including all shopping centres, newsagents, tourist hot spots, caravan parks, motels, real estate agents and more. Whilst great care has been taken to ensure the accuracy of the contents of the publications, the Rainbow Beach Cooloola Coast Community News accepts no responsibility for any inaccuracies. The views expressed in this publication do not necessarily represent the views held by the Rainbow Beach Cooloola Coast Community News. All content is copywrite and may not be reproduced without permission. THE PRODUCTION OF THIS FREE NEWSPAPER IS ONLY MADE POSSIBLE BY YOU CONTINUING TO SUPPORT OUR ADVERTISERS. Rainbow Beach Community News Copyright © 2013.